2014 ALBUQUERQUE SOUTH VALLEY SMALL BUSINESS DEVELOPMENT CENTER CLIENT OF THE YEAR. CLIENT OF THE YEAR Bahama Buck’s ! Margaret has been working with the Albuquerque South valley-SBDC since March of 2011. 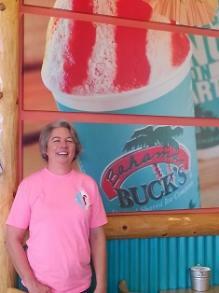 She is a nurse and wanted to start a “fun” business, a “Bahama Buck’s” franchise. She had the Hawaiian shaved ice product in AZ and fell in love with it. She knew after trying it, that was what she wanted. She initially came to see us for assistance with opening the franchise but we told her she should probably work on a business plan that was not a Bahama Buck’s plan but one from the standpoint of the owner. She attended all of our classes and worked diligently on her business plan. During this time, Margaret was busy finding a good location that had a drive-thru already built in and finally found one on Paseo del Norte. It had great traffic, decent visibility and lots of schools nearby. She knew she was going to need a loan to get this all started and we started working on getting her ready for the SBA process to get the loan. From there, we took the loan package to Western Commerce and she was approved, after much back and forth. She then went to work on getting the build out right for Bahama Buck’s specification and attending the franchisee training. She had to jump thru several hoops for the city, zoning, inspections etc. She opened in September of 2012. Margaret has been in business 2 full years now and her store is doing very well. She has increased sales by a little more than 10% from yr. 1. She still has 6 of her original employees and 2 have gone thru Bahama Buck’s management training. She has been working with some of the other new franchisees that are coming to Albuquerque to help them start out on the right foot. 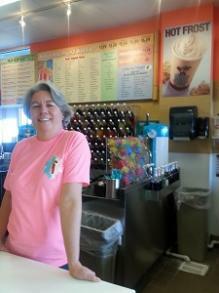 She is also considering getting into another type of franchise due to her experience with Bahama Buck’s.